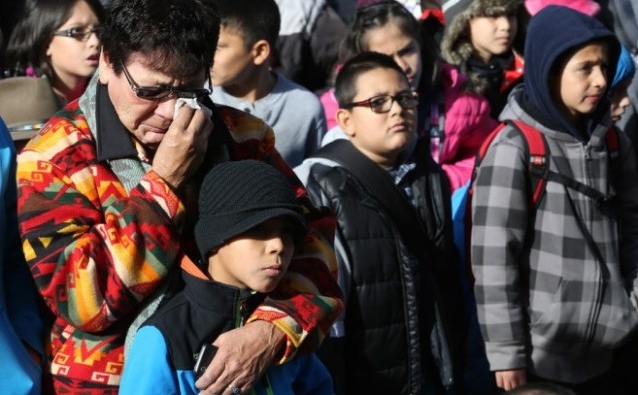 Every Thanksgiving weekend for the past 17 years, Arapaho and Cheyenne youth lead a 180-mile relay from the Sand Creek Massacre National Historic Site to Denver. 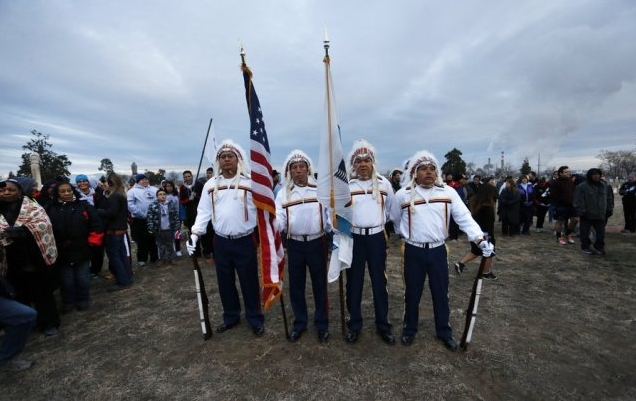 The annual Sand Creek Massacre Spiritual Healing Run opens at the site of the Sand Creek Massacre near Eads, Colorado, with a sunrise ceremony honoring some 200 Arapaho and Cheyenne people who lost their lives in the infamous massacre. This brutal assault was carried out by Colonel John Chivington on Nov. 29, 1864. While the Sand Creek massacre has been the subject of numerous books, much less attention has been given to two heroes of this horrific event: U.S. soldiers Captain Silas Soule and Lt. Joseph Cramer. These were men who rejected the violence and genocide inherent in the “conquest of the West.” They did so by personally refusing to take part in the murder of peaceful people, while ordering the men under their command to stand down. Their example breaks the conventional frontier narrative that has come to define the clash between Colonial settlers and Native peoples as one of civilization versus savagery. This is a theme I’ve previously addressed as a scholar in the fields of American Indian studies and Colonial history, both in my book on the Indian captivity narrative genre, “Buried in Shades of Night,” and more recently in writings on Sand Creek. Refusing to participate, Soule and the men of Company D of the First Colorado, along with Cramer of Company K, bore witness to the incomprehensible. Chivington’s attack soon descended into a frenzy of killing and mutilation, with soldiers taking scalps and other grisly trophies from the bodies of the dead. Soule was a devoted abolitionist and one dedicated to the rights of all people. He stayed true to his convictions in the face of insults and even a threat of hanging from Chivington the night before at Fort Lyon. While few Americans – especially those living outside of Colorado – may know their names, Soule and Cramer are honored and revered by the ancestors of the people they tried to save. 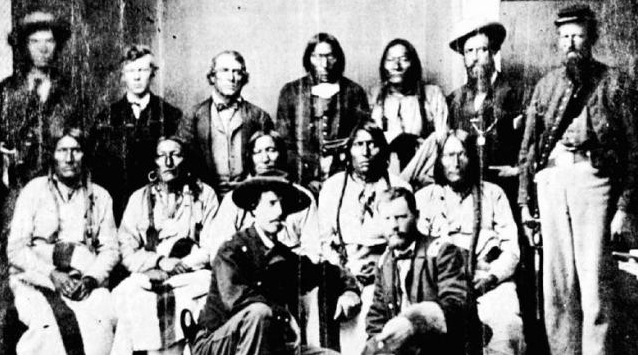 According to David F. Halaas, former Colorado state historian and current historical consultant to the Northern Cheyenne, without their courage in disobeying Chivington’s orders and keeping their men from the massacre, “the descendants probably wouldn’t be around today,” and there would be no one to tell the stories. The horrific descriptions of Soule and Cramer prompted several official inquiries into the atrocity. Both men also testified before an Army commission in Colorado as witnesses. While the officers and soldiers responsible escaped punishment, their testimony brought widespread condemnation upon Chivington, who defended the act until his death. These investigations also ended the political career of the Colorado territorial governor, John Evans, who had issued two proclamations calling for violence against Native people of the plains, and for organizing the 3rd Colorado Cavalry Regiment in which Chivington was placed in command. The Cheyenne and Arapaho will return to Denver this year to honor their ancestors and remember Soule’s and Cramer’s conscience and humanity. This will be done through an offering of prayers and blessings, along with the performance of honor songs. 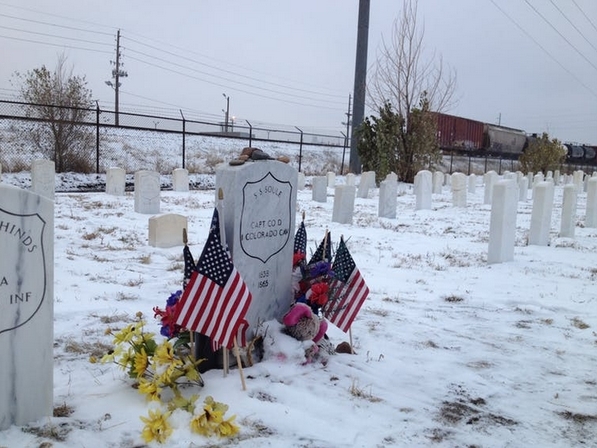 On the third and final day of the healing run, they will gather for a sunrise ceremony at Soule’s flower-adorned grave at Denver’s Riverside Cemetery. The participants will then continue on to 15th and Lawrence Street in downtown Denver. There, a plaque is mounted on the side of an office building at the place where Soule was murdered on April 23, 1865. His death, for which no one was ever brought to justice, occurred only two months after he testified against Chivington before the Army commission. Over the last few decades, Soule’s grave and place of death have been transformed into sacred sites of remembrance within a violent and traumatic frontier past. The catastrophe of the Sand Creek Massacre is recognized by historians as among the most infamous events in the annals of the American West. Even now, it is the only massacre of Native people recognized as such by the U.S. government, with the land itself preserved as a national historic site for learning and reflection. In Cheyenne and Arapaho stories, this event remains an ever-present trauma and persists as part of their cultural memory. In addition, it encapsulates the stark moment of betrayal against their ancestors and the theft of their lands. The story of Soule’s and Cramer’s actions and their courage to say “no” to the killing of peaceful people at Sand Creek is an important chapter of U.S. history. I maintain that it is people like Soule and Cramer who truly deserve to be remembered through monuments and memorials, and can be a source for a different kind of historical understanding: one based not on abstract notions of justice and right, but upon the courage and integrity it takes to breathe life into those virtues. On the 152nd anniversary of the Sand Creek Massacre, as we honor the memory of those who died at Sand Creek, may we also be inspired by the heroic actions of these two American soldiers. This article was written by Billy J. Stratton, professor of Native American studies/contemporary American literature, University of Denver, for The Conversation. It has been republished with permission. Responses to "Remembering U.S. 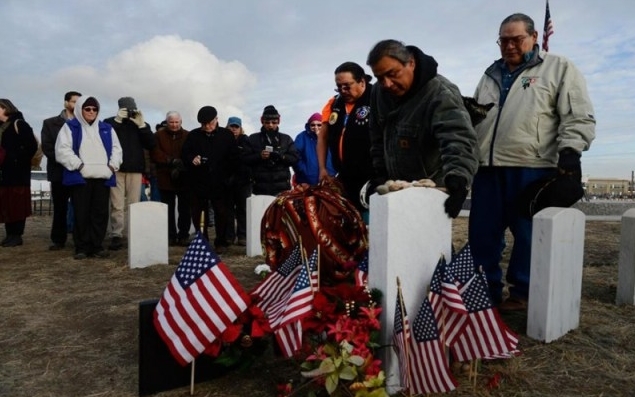 Soldiers Who Refused To Kill Native Americans At Sand Creek"
Thank you for this story of Truth reading this makes me quite emotional and thank you for sharing I will keep these Brave souls in my prayers. Sometimes one person telling the truth can make a difference. So much sadness and atrocities in the World... Soon Jehovah God (Yahweh in Hebrew) will step in and end all the injustices. He promises the Earth will be returned to Paradise, and he will guide us from the Heavens (Thy kingdom come, thy will be done, on Earth as in heaven) Kingdom is an ancient word for government. Jehovah is incapable of Lying. What He says will happen, will happen. See Daniel 2:44 and Revelation 21:3,4, for a glimpse of that kingdom. The wicked will be destroyed "and you will find exquisite delight in the abundance of peace". That is from the Psalms. Only the meek and kind will be left upon the earth, who walk modestly with and listen to their Creator/Father. See jw.org for more information about the Future! Forget Jehovah's Witnesses (jw.org). You guys came to the ball game almost 20 centuries after the Scripture was completed, translated and made available to numerous dialects and nations. God was not in Heaven above wringing His hands awaiting the birth of Charles Taze Russell to correct what Jesus Christ said that Satan could not prevail against, Matthew 16:17-19. As to this bit of history, it reminds me of the US Army pilot Hugh Thompson, Jr. who defended innocent VietNamese civilians against an attack ordered by Lt William Calley at My Lai. "Men most resemble beasts in wartime, humans when they are at table and God when they forgive." Let us make sure that the names of Silas Soule and Joseph Cramer are remembered as true heroes! If each of us acted only once in our lives with such grace, clarity and courage, we would all see a better world.